The Calder Valley main line, and the line over Copy Pit, really came into its own on Summer Saturdays when a procession of excursion trains left a wide variety of Yorkshire towns to head to the Lancashire seaside resorts of Blackpool, Southport and Morecambe. At Hall Royd Junction trains there was a choice of routes, although the more common route for the excursions was over Copy Pit and so to Burnley, Blackburn and Preston. At Preston they could pass though Preston and so onto the lines to Blackpool, or they could take a left turn at Todd Lane Junction and head for Southport along the coast. Trains staying with the L&Y main line could be routed towards Bury at Castleton, just after Rochdale. At Bury they could turn right and head for Accrington, and join the earlier route to Preston, or they could carry on straight through Bury to Bolton, and then be directed to Southport via Wigan or towards Preston and Blackpool at Lostock Junction. It will be apparent that with a multiple of starting points coupled with a surprising number of alternative routes and destinations which were only accessed for a relatively small number of Summer Saturdays each year that loco crews were going to need a lot of training, particularly at the start of each year, ready for Easter. The 'British Railways Magazine London Midland Region', Volume 11 Issue 12 dated December 1960 featured a photo by railwayman K Crowther from the steps of Hall Royd Junction signal box showing loco crew training in progress. The York Motive Power Deport route leaning coach is shown being propelled Up the L&YR main by an Ivatt Class Mogul. The caption suggests that it contains LMR drivers out learning the road, travelling to Blackpool via Rochdale and Bolton. It is assumed that the photo was taken in the early months of 1960 (snow on the ground), and that K Crowther was the signalman on the day. 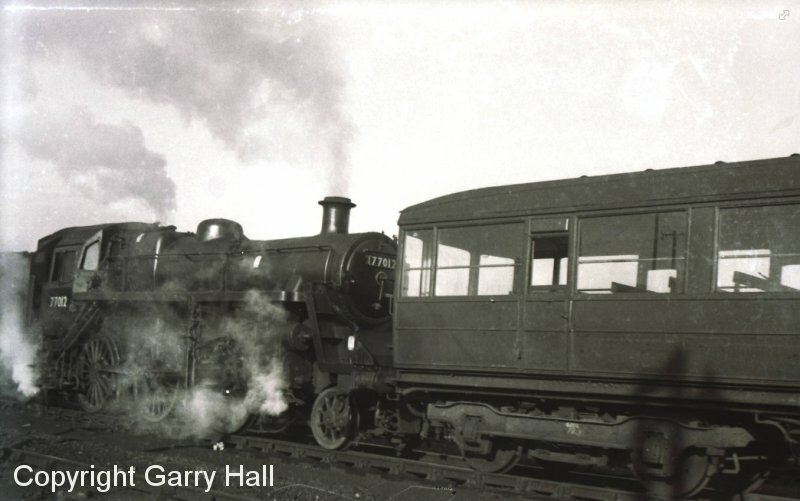 Clive Mortimor on the RMWeb group has noted that a photo of this carriage appears in Backtrack Volume 10 No. 4 dated April 1966 on page 184. This shows a Gresley teak vehicle numbered DE 320765 and lettered MOTIVE POWER DEPT, YORK on the side. It sports a yellow end. The photo is dated 6 August 1965 and the car is being propelled by Fairburn tank 42204, at, err, York Station. As the photo is black and white, it would be easy to assume that the livery was a faded maroon. However David Ford has located a photo of the carriage in his father's collection showing it being pulled by a Class 46 in the down direction at Pilmoor which is posted on an RMWeb thread. The photo is dated April 1968 and the carriage is painted matt black, with yellow warning panels. 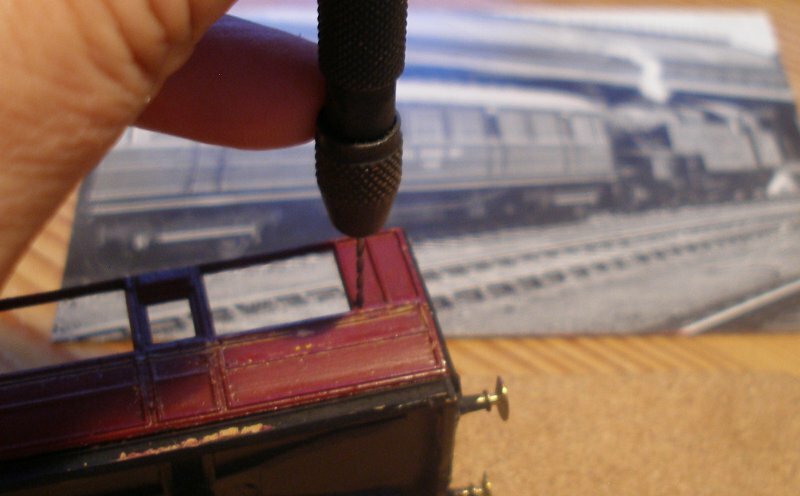 The 'control trains' formed of Gresley stock that existed in the 1960s are also reported to have been painted black. I am very grateful to Garry Hall for permission to reproduce his photograph of BR Standard 77012 at York with the Route Learning Car. All the photos I have seen of the carriage in operation with steam, shows the loco facing forward when propelling, and on that basis it is quite likely 77012 is readying for such a trip. Garry records 77012 was a York-based loco, which begs the question where she might had roamed whilst on route learning duties. Hugh Llewllyn suggests this is a GNR Gresley 52'6" First Saloon No.807 built at Doncaster 1912, which became LNER No.4807 and was refitted as an Engineer's Saloon, BR No.DE320765 as pictured at York Shed, 07/67, although the coach is clearly on a 61' 6" underframe. The photo on Wikipedia shows it with Gresley compound bolster bogies. This is a delightful cameo, and it is reasonable to assume that it was kept pretty busy covering these holiday specials. In the BR Magazine the loco isn't identified, and I have decided to provide 43101 which was then shedded at Wakefield, which seems as likely as any for a point of origin. 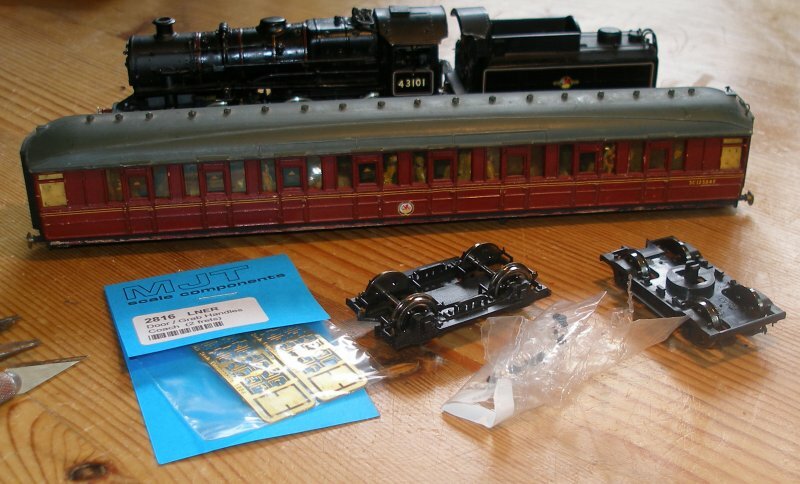 In my freelance modelling days I bought a ready-built Millholme Ivatt in plain black. The open frame motor could not be easily converted to DCC, and this was replaced by one of the 1218 RG4s. The loco was renumbered as Wakefield's 43101. 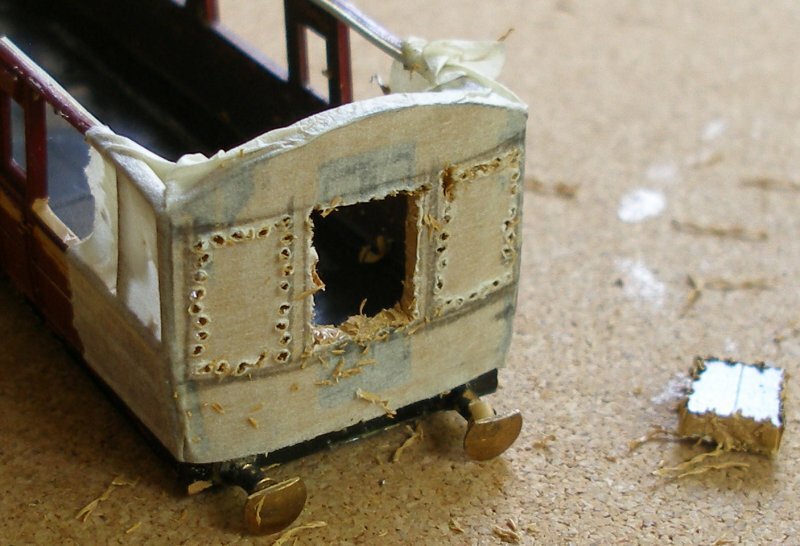 Having sorted the loco out, it was time to turn to the coach. From careful study of the available photos, the seating seems to formed of station waiting room benches mounted on a series of raised steps. The Hall Royd photo shows 10 'jolly' drivers in various posses draped across the benches. 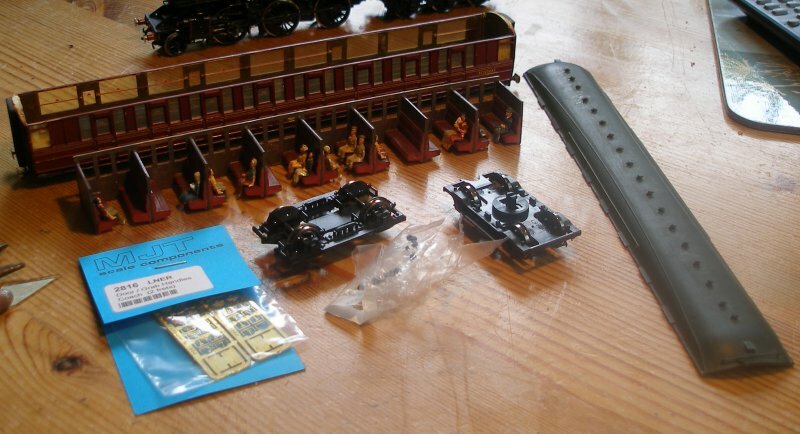 The closest 'fit' appeared to the green plastic Merit-type, and two sets of seated loco drivers were also bought. I was sorely tempted to 'restore' the Ian Kirk, as it was a nicely assembled kit, but as a certain amount of work was required, I concluded it would be just a easy to proceed with the conversion. 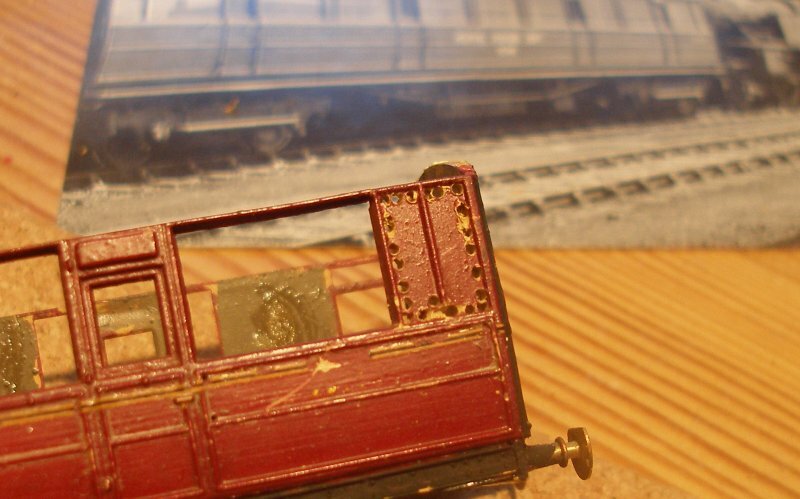 The Hornby bogies are nicely made models, but note the bag of 'bits' these seem to the parts of the springing (very apparent in prototype photos) which have clearly fallen off the bogies and were loose in the bag. These were carefully gathered up for refitting. The first step was to remove the roof, which has sensibly only been glued at the ends. The interior had been glued in, but the joint had failed, and it was easy to lift out. The corridor connections came off relatively easily, and the rouge edges created by the glue removed. Only half the original interior is required. It is assumed that the middle four compartments were retained either for staff not directly involved in the route learning process or for when the route learning had finished for the day, and drivers wanted somewhere more comfortable to sit as they headed home. (It is not known where the guard might have travelled). 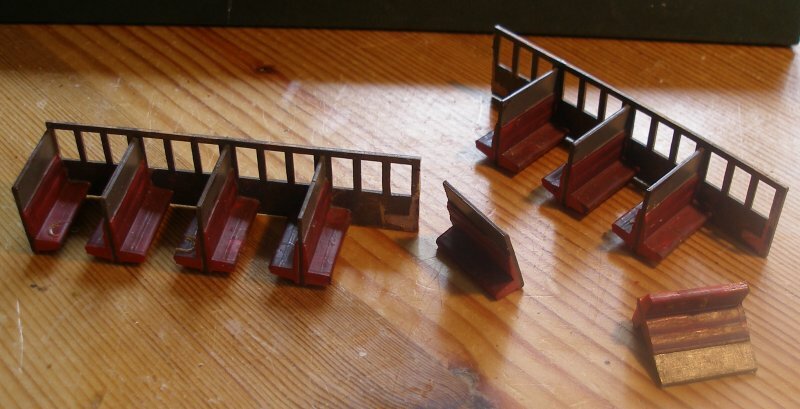 The central double seat was removed (it was only glued to the corridor partition), and then the corridor partition vertically scored and then bent until it snapped neatly on the score line. The single seat unit was removed from the end of the surplus unit, and in the above shot, is ready to be fitted to the shortened seating unit. Great care is needed drilling the holes, and in particular along the top edge, taking care not to damage the adjacent window frame top rail. Finally, with a brand new blade, the holes are joined up, and the panelling removed. Great care was taken with the top edge, with the work being carefully supported whilst gently cutting/sawing. This photograph shows all the panels that need to be removed now drilled, but still in situ. The horizontal glazing bars in the windows at the ends also need to be removed, but I've left them in place for now, thinking it will give a little extra strength during the cutting out phase. 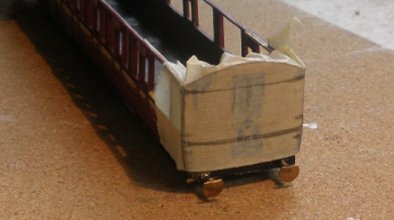 For the avoidance of doubt, on the compartment side, two openings are going to be formed. 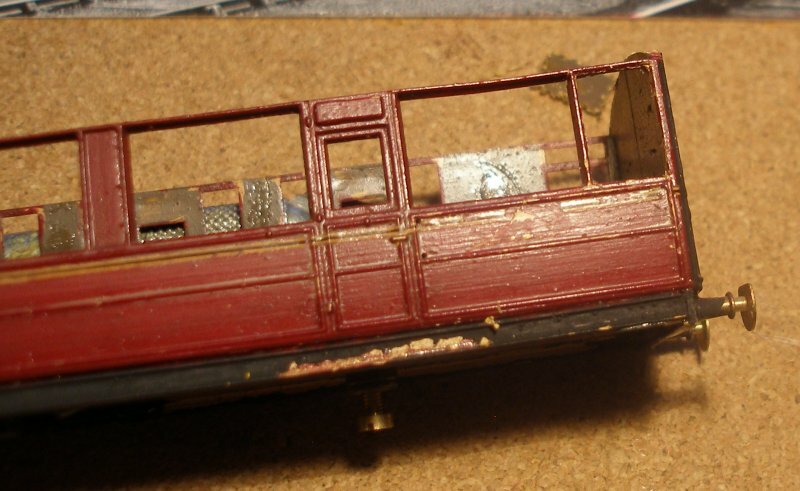 So looking to the right of the coach side in the upper image, the first three panels next to the door will form one larger window, and the glazing bar will be removed from the surviving original window, so that the ends of the vehicle will be identically configured on both sides. The next stage is to form the end windows. Masking tape was affixed across the end, and then the windows marked out. A series of holes were drilled round the three window frames using a pin vice. With the ends marked up, the areas to be cut were first drilled out using a manual pin vice, and then the holes gentle teased out into a cut using a new scalpel blade. The original model had the classic strip of Perspex glued behind the plastic side. This didn't look at all convincing, and my intention is to create individual pieces of glazing, and insert them into the window aperture. This method would suit this particular vehicle as all the windows require nice, relatively large sized pieces. 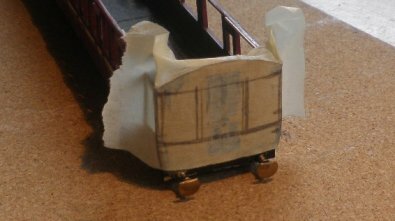 As you do, Google took me to an article published by the Barrowmore Model Railway Group in which David Goodwin explains his methodology using a material called Lexan. David notes that the material comes in large sheets, but fortunately it is available via eBay in handy 1mm thick A5 sized sheets at a very affordable £2.45 a sheet.